Watch the above video again. What is wrong with this picture? Look, I LOVE religious minorities, okay? I’m Muslim myself. I love my Jewish friends. I used to practice Buddhist meditation. And I still revere the wisdom of the Tao and the Upanishads and the many wonderful Native American spiritual traditions. Oh my God. Talk about the demeanor of a mind-controlled zombie….. Instead of saying “happy Easter” and talking about Jesus, and maybe throwing in some eggs and rabbits as a sop to Christian-pagan syncretism, Trump begins by rambling on and on about how wonderful Jews are. He couldn’t make it any clearer that his main holiday message is “Happy Passover!” When he finally gets around to mentioning Easter, it’s almost an afterthought. 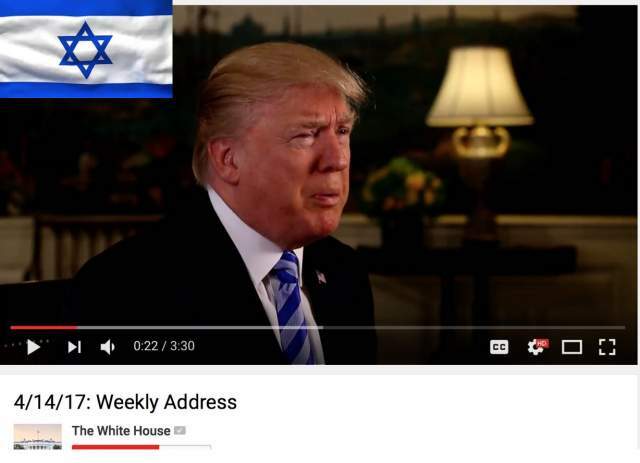 The video has abysmally poor production values, considering that it’s coming from the White House. It’s too dark. And Trump looks extremely low-energy –like a kidnapping victim in a hostage video with someone offscreen pointing a gun at his head or a knife at his foreskin. The weirdest holiday video ever made by any sitting president? Trump’s “Passover video” reminds me of the nationally televised speech by George W. Bush in early December, 2001. Bush gave that speech, in which he monotonously intoned the shibboleths of the Israeli-fabricated “War on Terror,” in front of an Israeli flag, not an American one. Until around 1800, when the Rothschilds took over the financial centers of Western Europe and imposed their ideological hegemony on the West, Christians took it for granted that “the Jews killed Jesus,” as the Gospels tell us in so many words. Jews, for their part, evinced extreme loathing for Christianity in general and Jesus in particular. The Christian was “Esau,” the naive, hairy, primitive fool who needed to be swindled out of his birthright by Jacob “the heel” AKA “Israel.” And Jesus, according to the Talmud, is being boiled eternally in excrement. Maybe it’s a good thing that the Jews and Christians are getting over their horrible history of mutual hatred. But it strikes me as odd that the way they’re getting over it is through a stealth Jewish-Zionist takeover of the West, accompanied by what can only be called the annihilation of traditional Christianity. Trump’s Easter message, coming in the wake of the ouster of Steve Bannon (Catholic) and elevation of Jared Kushner (Kosher Nostra) is a sign of the times. The United Nations Refugee Agency (UNHCR) warned last week that 20 million people are in danger of starvation because of conflicts and drought. If you missed this shocking and very important news, then it’s no surprise, as it didn’t receive too many headlines – certainly not in the West. Those have been dominated instead by expressions of faux-outrage from the pro-war political and media Establishment over footage of children in Syria who appeared to have been the victims of a suspected chemical weapons attack, which the US and its allies were very quick to blame, without firm evidence, on Syrian President Bashar Assad. How do we know that the Establishment concern we saw about child victims of war was insincere? It’s easy. True humanitarians care about all victims equally. The concern of phony humanitarians is only for those who have been killed, or who appear to have been killed, by an ‘Official Enemy’ of the Western elites – like Assad. This ‘outrage’ has to be expressed strongly, and very publicly, in order to build support for the bombing of the ‘Official Enemy’ country, and further the case for regime-change, which helps the arms industry and the 1% get even richer. However, if it’s an ally of the West or Western powers themselves responsible for the atrocities, it’s a very different story. Then it’s a case of: “Don’t mention the war!” Let’s change the subject as quickly as we can! Bellicose ‘liberal interventionists’ become as quiet as church mice. What made the double standards even more glaring this week is the fact that a large proportion of those facing starvation, as identified by the UNHCR, are in Yemen, which has been bombed by staunch Western ally Saudi Arabia for two years now. “In Yemen, which is experiencing the world’s largest humanitarian crisis with almost 19 million people in need of humanitarian help, around 17 million people are food insecure,” UNHCR spokesperson Adrian Edwards said. The very same countries who are directly responsible for the “world’s largest humanitarian crisis” in 2017 are – surprise, surprise! – the ones who have sought to take the moral high ground over Syria. The same neocons and ‘liberal interventionists’ who screech “Something must be done about Assad!” on social media from 6 o’clock in the morning until 11 o’clock at night are quite happy for absolutely nothing to be done to stop the suffering in Yemen. One man who did try to end the slaughter in the country was Labour leader Jeremy Corbyn- a consistent target of the Endless War lobby. Last October Labour put forward a motion in the British Parliament calling for the UK to suspend its support to Saudi Arabia. The resolution failed because over 100 Labour MPs either didn‘t turn up- or abstained. One of them was Corbyn’s deputy Tom Watson. ‘How can Labour ‘humanitarians’ support Saudi Arabia’? asked Stop the War’s Lindsey German. When it comes to humanitarian humbug there’s no difference between right-wing Labour, the Lib Dems and the Tories. Or, in America, between Democrats and Republicans. Vicar’s daughter Theresa May has spent most of the last few days robotically denouncing ‘the Assad regime’-which is battling ISIS and al-Qaeda and protects Syria’s Christian community from religious persecution. Yet just ten days ago the British Prime Minister was defending UK ties to Saudi Arabia on a trip to Riyadh. For all the moral grand-standing by May and Johnson and Trump and Tillerson, the bloodshed and chaos unleashed by the west and its allies in recent decades dwarfs any crimes that could be laid at Assad’s door. In 2015, it was revealed that at least 1.3m people, the vast majority of them Muslims, lost their lives in the US‘s so-called ‘War on Terror’ in just three countries; Iraq, Afghanistan and Pakistan- between 2001 and the end of 2013. The Body Count death toll as I pointed out in my earlier OpEdge does not include deaths among the 3m refugees from Iraq subjected to privations, nor those killed in Libya and Yemen. But in spite of the mind-boggling numbers involved the victims of US-led military interventions are ’un-people’ who have been airbrushed out of western history. Only Muslims killed by ‘Official Enemies’ are mourned- and splashed on the front pages of Establishment-friendly newspapers. When it comes to infanticide, the same grotesque double standards are on display. In a 1996 television interview about the impact of sanctions on Iraq, the US Secretary of State Madeline Albright was asked if the death of half a million Iraqi children was a price worth paying. She replied ‘I think this is a very hard choice, but we think the price is worth it’. Just imagine if Putin or Assad had said such a thing! In an interview with David Edwards of Media Lens, Denis Halliday, the former UN Assistant Secretary General- and the co-ordinator of the UN humanitarian oil for food programme – said that the shortage of food and medical supplies in Iraq was the direct responsibility of Washington and London. ’For the British government to say that the quantities involved for vaccinating kids are going to produce weapons of mass destruction, is just nonsense. That’s why I’ve deliberately used the word ‘genocide’ because this is a deliberate policy to destroy the people of Iraq’, Halliday said. 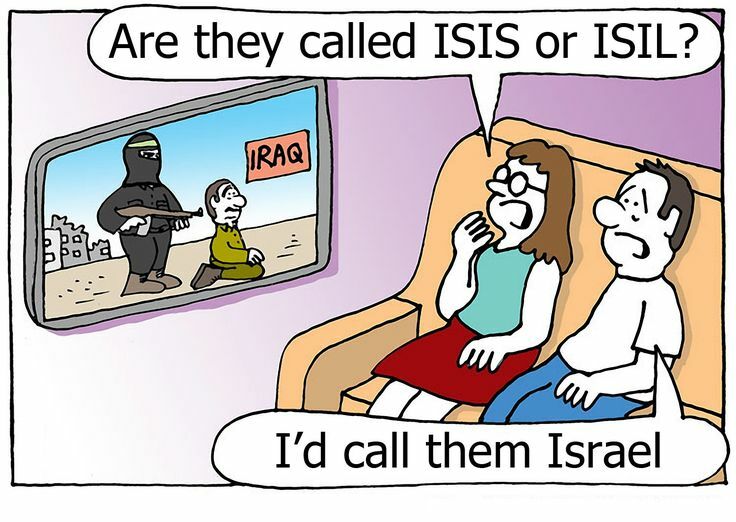 The genocide which preceded the Iraq war is a taboo subject in the west- like the genocide which came after it. Instead, we’re encouraged to focus solely on the ’heinous crimes’ of our ‘Official Enemies’. They- Assad, Gaddafi, Milosevic- are always ‘butchers’- ‘our’ leaders can never be called that- even if they kill millions more and illegally attack, or threaten to attack, different countries every few years. Back to the UNHCR warning. In South Sudan, 100,00 people face starvation- and a further 1m are on the brink of famine. In northern Nigeria seven million people ‘are now struggling with food insecurity and need help’. The situation is perilous in Somalia too. Getting food supplies to these unfortunate people ought to be the number one priority for genuine humanitarians. But what was the top of the agenda for last week’s G7 meeting? How to get Russia to end its support for Assad! This is the neocon agenda of the warmongering elites and not of those who really care about humanity. Next time you come across a ‘humanitarian’ saying that toppling Assad and ‘dealing’ with Putin is the most pressing issue, ask them why it’s more important than saving 20 million people close to starvation. They won’t have a satisfactory answer. Zionist Ab-A$$ security forces briefly detained two undercover Nazi army soldiers who were conducting a military raid in the Rafidiya area of the northern occupied West Bank city of Nablus on Saturday evening, according to official Zionist Ab-A$$ and Nazi sources. The two were taken to a Ab-A$$ police station in Nablus. An Nazi army spokesperson confirmed the incident to Ma’an, saying that during an Israeli army “activity,” the officers were “briefly questioned by Ab-A$$ security forces,” adding that in coordination with the Nazi Civil Administration, the soldiers were returned to Nazi custody. According to Zionist daily Haaretz, the two soldiers — members of an Arabic-speaking unit of the Nazi army known as the “Mustarabeen” in Arabic, who are responsible for infiltrating and carrying out detentions in Palestinian communities — “scuffled” with Ab-A$$ police officers for some time before they were returned to Nazi forces. Their gear and weapons, as well as the car they were driving in, was also also reportedly returned. The incident represented a rare standoff between Zionist Ab-A$$ and Nazi forces, Zionist Ab-A$$ regularly allows Nazi forces to enter PA-controlled areas in the West Bank to conduct daily detention raids and other military operations, in contravention of the Oslo Accords. 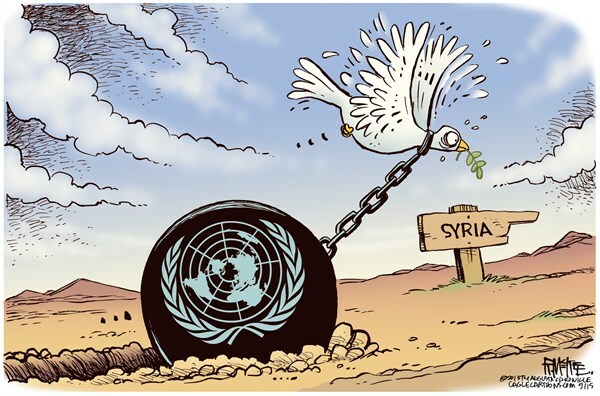 The refusal of the United Nations to qualify the recent US airstrike against Syria as an act of aggression makes the Organization irrelevant – something Russia has been trying to prevent. It has become vulnerable to scathing criticism after demonstrating its impotence and inability to act. The continued paralysis is an eloquent example of the UN’s disengagement and lack of political will to fulfill its duty. The Organization’s image has suffered great damage. It still has a chance to rectify it by launching an investigation into what really happened in Syria. Article One of the UN Charter states that one of the purposes is «To maintain international peace and security, and to that end: to take effective collective measures for the prevention and removal of threats to the peace, and for the suppression of acts of aggression or other breaches of the peace». It also mentions «adjustment or settlement of international disputes or situations which might lead to a breach of the peace». The April 7 attack on Syria is no doubt an act of aggression against a sovereign state. There is nothing to support the US accusations against the Syrian government. No evidence to go upon has been presented. If it were, it would still be no reason to use force. Neither the UN Charter nor any other international document envisages the right of US president to strike other countries at his discretion, even if they are suspected of possessing and using chemical weapons (CW). The US has a long record of trampling on international law under the pretext of conducting military operations for «humanitarian reasons» or to protect «democracy». The UK and several other Western countries rushed to support the action. No wonder! If they had the capability, they would have done the same thing. The prospects for being left without the US «nuclear umbrella» made them really scared after Donald Trump was elected. Now they are happy that the 45th president has failed to keep his promises. Their support for the US action is understandable and was expected. But what about the United Nations? The Secretariat of the UN has shied away from taking a position. Stéphane Dujarric, Spokesman for the Secretary-General, emphasized that neither the CW attack in Idlib nor the following US airstrikes influenced the UN stance. According to him, «For us, we would reiterate the importance of the process going on in Geneva, which, obviously, one of the issues on the agenda is transition. What is important is that the future leadership of Syria be decided by the Syrian people themselves, as we have said since the beginning of this crisis. And, again, I think we would call on all the parties to recommit themselves to the Geneva process and the political discussions going on in Geneva». Asked about the statement made by Nikki Haily, the US Ambassador to the UN, about the loss of legitimacy by Syrian President Assad after the chemical attack, he said «the future leadership of the Syrian… of Syria should be decided by the Syrian people themselves». At least, the official admits that it’s the people who should rule the country, not the leaders of other states who order to strike Syria with cruise missiles! On the other hand, the refusal to condemn the United States for its attack in Syria makes the law a sham. The strongest is always right! The UN turns a blind eye on violations and crimes. There is another aspect of the problem that is important to draw attention on. The Organization for the Prohibition of Chemical Weapons (OPCW) has said Syria has no CW. In 2013, the elimination of CW in Syria was an OPCW-UN joint mission. 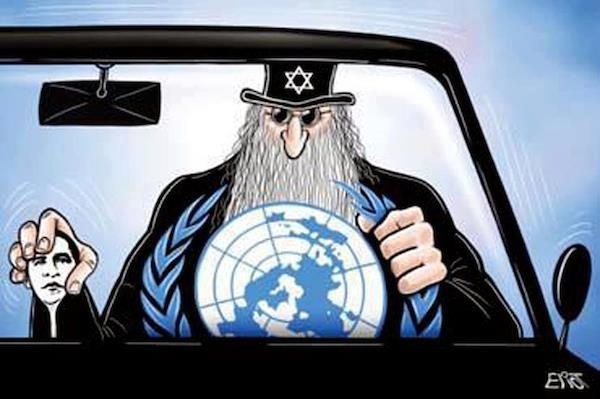 Is the organization operating under the auspices of the United Nations not trustworthy? If it is, why not wait for its results of its investigation? Thus, the very affirmation that the Syrian government has CW is a severe blow against the OPCW and the UN. So, the stance taken by the UN Secretariat actually diminishes the UN influence on international affairs. The UN refuses to comply with the provisions of its own Charter! What’s wrong with Russia’s calls for broader UN role? Moscow says important decisions related to international security must be taken collectively and after detailed consultations in the UN. Should this position be resisted? Is it reprehensible to insist on thorough investigation of CW attack in Idlib before discussing the issue and taking decisions on what to do about it? Is it right to forget the lesson learnt in Iraq when no weapons of mass destruction were found to justify the invasion with terrible repercussions to follow, including the emergence of the IS? An investigation would meet the interests of all. That’s what UN officials should be talking about instead of repeating the mantra of the Geneva negotiations having a chance to make progress. Turgid words to make a hollow statement. A CW attack is a serious crime against humanity. The culprits must face justice. So is the US attack against a UN member state. At least, it must be discussed within the framework of the United Nations. The US could veto any decisions but the world has the right to know. With all the tensions running high and global security threated, the time is propitious for the UN to start fulfilling its duties and abide by its obligations. The world needs deeds, not empty words. McCain loves terrorist states like Saudi Arabia. He wants to bring “democracy” and “freedom” in places like Iraq, Afghanistan, Libya, and Syria, but not in Saudi Arabia. Nonsense rules the Neocon world, and if you don’t think that this is true, then look into the life of John McCain. McCain is old (80 years old), but he doesn’t want to be obsolete. He wants to incite perpetual wars virtually all over the Middle East. And he wants to make a name for himself. 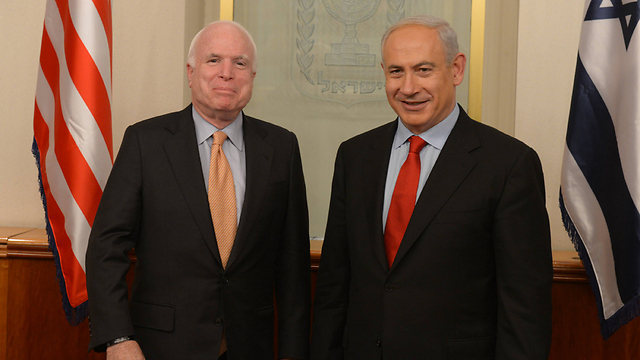 McCain loves to make political moves—crazy and diabolical moves—but he doesn’t act independently. He cannot act independently precisely because that would ruin his Zionist project. He is a Rothschild puppet. He politically doesn’t have an opinion of his own because he has been paid to say weird things, wild things, crazy things, incoherent things, and ultimately dumb and diabolical things. “Yet, for all the outrage these executions have engendered the world over, decapitations are routine in Saudi Arabia, America’s closest Arab ally, for crimes including political dissent—and the international press hardly seems to notice. In fact, since January , 59 people have had their heads lopped off in the kingdom, where ‘punishment by the sword’ has been practiced for centuries…. Public decapitations are foreign to Syria, where Assad has been protecting the small minority of Christians. But not a single Neocon mush-head or pinhead has challenged Saudi Arabia over the past few years or so. In fact, John McCain himself declared: “Thank God for the Saudis and Prince Bandar, and for our Qatari friends.” Why was McCain thanking the Saudis? Well, he got a big chunk of money from them—at least one million dollars. If justice delayed does not necessarily mean justice denied, then McCain will face the consequences of his own diabolical actions—either in this life or the next. He supported the Iraq war in 2003, which created a devastating effect on the entire country. The same war sent a six-trillion dollar bill to America. Now McCain is still asking for perpetual wars all over the Middle East, while the average American is desperately trying to feed their family. These people want to create trouble. 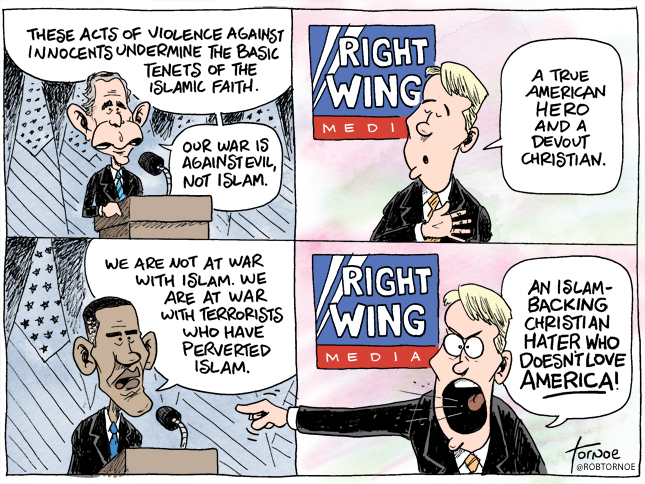 They want to incite hatred. Now they are saying that North Korea is the new axis of evil that needs to be expunged! Janine Di Giovanni, “When It Comes to Beheadings, ISIS Has Nothing over Saudi Arabia,” Newsweek, October 14, 2014. Steve Clemons, “’Thank God for the Saudis’: ISIS, Iraq, and the Lessons of Blowback,” Atlantic, June 23, 2014. Bill Allison, “McCain-Linked Nonprofit Received $1 Million From Saudi Arabia,” Bloomberg, March 31, 2016. Susan Stojanovic, “McCain: Russia cooperated with Syria in chemical attack,” ABC News, April 10, 2017. “‘We are sending an armada’: Trump ready to eliminate N. Korean ‘menace’ with or without China,” Russia Today, April 13, 2017. North Korea may have the ability to launch missiles with warheads filled with nerve gas, Japanese Prime Minister Shinzo Abe said on Thursday, April 13. Abe also said that North Korea may soon conduct a sixth nuclear test or launch ballistic missiles again. “There is a possibility that North Korea is already capable of delivering missiles with sarin in its warheads,” the Japanese prime minister said at parliamentary hearings, Reuters reports. Shinzo Abe recalled the infamous sarin attack in the Tokyo subway system from 1995. The attack, conducted by Aum Shinrikyo Japanese sect, killed 12 people. On April 15, North Korea will celebrate the 105th anniversary since the birth of the founder of the DPRK, Kim Il Sung. This is the largest national holiday in the country, which is called the Day of the Sun. Kim Il Sung is referred to as the “Sun of the Nation” in the DPRK. In the past, North Korean leaders would test weapons on April 15. Meanwhile, spokespeople for the South Korean Defense Ministry expressed their readiness to show resistance to “provocations of the North,” which may follow in connection with the celebration of the Day of the Sun on April 15. In addition, Seoul does not exclude a possibility of either a nuclear or a missile test on the 85th anniversary of the Korean People’s Army, which the North celebrates on April 25. Reportedly, the DPRK is prepared for a new nuclear test. According to 38 North U.S.-Korea Institute, commercial satellite images of the North Korean nuclear test site in Phungeri showed activity at the northern terminal, as well as new activity in the main administrative zone and a certain number of personnel around the command center of the test site. The images were taken on April 12. Against the backdrop of growing tension on the Korean Peninsula, a question arises about further actions of the allies of the two Koreas. According to Japanese media outlets, the USA supposedly considers only two options for the situation to develop: either China increases pressure on the DPRK, or the United States attacks North Korea, should Beijing continue demonstration inaction. Noteworthy, the US administration welcomed China’s move to abstain fro the voting in favor for the draft resolution of the UN Security Council to investigate the chemical attack in Syria’s Idlib. China made the decision following President Xi Jinping’s official visit to the United States. The White House called the decision a huge diplomatic victory. In the meantime, Syrian President Bashar Assad expressed his support for the DPRK by sending a telegram to North Korean leader Kim Jong-un congratulating him on the 105th anniversary of his grandfather’s birthday. In the message, Assad calls the DPRK and Syria “friendly countries,” that counteract to “insane ambitions of major powers” whose intent is to subjugate other countries through expansionist and predatory policies. Russia, for its part, is also monitoring the situation on the Korean Peninsula. On April 11, a group of Russian Navy warships arrived at the South Korean port of Pusan. The official goal of the campaign is the demonstration of the St. Andrew’s flag in the Asia-Pacific region and the further development of naval cooperation with APR countries. On April 13, commander of the Pacific Fleet of the Russian Federation, Admiral Sergei Avakyants had a meeting with commander of the South Korean Navy, Vice Admiral Chung Jin Sobu. The meeting took place at the naval base of Pusan. The officials discusses issues of international military cooperation between the fleets of the two countries. In the meanwhile, US aircraft carrier strike group lead by USS Carl Vinson is heading to the shores of South Korea. The group includes a missile cruiser and two missile destroyers. DPRK officials, commenting on the dispatch of US ships to the Korean Peninsula, declared their readiness to get involved in a military confrontation with the United States should tensions escalate further. “We will take most severe countermeasures against the provocateurs to defend ourselves with the might of our weapons,” spokespeople for the North Korean Foreign Ministry said. Pravda.Ru requested an opinion about the current development on the Korean Peninsula from Yevgeny Kim, an expert with the Center for Korean Studies at the Institute of the Far East. “The South Korean press considers the dialogue between Trump and Xi Jinping most important now. Xi Jinping has just returned from Washington. Yesterday, the Chinese leader had a telephone conversation with Trump. The fact is that Xi Jinping still believes the crisis should be resolved peacefully. “The Americans may attack first, and then say that it was Pyongyang that attacked them first. They will use it as a reason to strike North Korea. They can do it easily, they have done that before – they started the war in Vietnam that way. They said that the Vietnamese attacked an American destroyer and a cruiser, but in fact it turned out that nothing like that happened, but the USA had already started military actions against Vietnam. “Let’s remember the year 2013, when a decision was made to eliminate chemical weapons in Syria. ISIL terrorists staged a provocation back then too. They blew up ammo near Damascus and accused Assad of that. The Americans interfered, but Russia came to regulate the problem peacefully. Russia said that Damascus was willing to destroy all of its chemical weapons. “The Americans want China to put more pressure on North Korea – not only politically, but also economically. Strengthening economic sanctions against the DPRK could be an option. After several months of pushing the “Russiagate” conspiracy theory – a wild-eyed, all-encompassing but somewhat nebulous narrative involving U.S. President Donald Trump, Russian President Vladimir Putin, WikiLeaks, the Russian mob, assassinations and certain indiscretions with prostitutes in a Moscow hotel – the U.S. mainstream media is now reverting to its traditional role of downplaying conspiracy theories, particularly those raising questions about the intelligence surrounding the alleged chemical weapons attack in Syria last week. On Monday, the New York Times published an article titled “Syria Conspiracy Theories Flourish, at Both Ends of the Spectrum,” which lamented the fact that websites on the left and the right have raised doubts about the casus belli for U.S. military action against Syria. Noting that some alternative news sites have called the chemical attack a “false flag” operation and others have raised the question of whether Trump’s military action was a “wag the dog” diversion tactic, the Times pointedly attempts to “debunk” the internet memes that have been raising doubts about the chemical attack or calling into question the justification for the U.S. military action. Floating a few reasons that Assad’s forces might have conceivably been motivated to conduct a chemical attack, the Times argues that the attack was “consistent with Mr. Assad’s calculated strategy of attempting to drive out the civilian population in rebel strongholds through bombing neighborhoods and civilian targets.” The Syrian leader may have also “felt emboldened” by perceived shifts in U.S. foreign policies and priorities under Trump, the Times speculates. With this in mind, Sacha Llorenti, the Bolivian ambassador to the United Nations, last Friday blasted the United States for unilaterally attacking Syria, saying that it recalls the decision 14 years earlier to attack Iraq based on equally questionable intelligence. It is “vital to remember what history teaches us,” Llorenti said, citing the 2003 invasion of Iraq and holding up a photo of then-Secretary of State Colin Powell delivering false testimony to the UN Security Council on Iraq’s alleged weapons of mass destruction. “Whereas an investigation would have allowed us to establish in an objective manner who is responsible for the [chemical] attacks [in Syria], this is an extreme, extreme violation of international law,” he said. In addition to the doubts that have been raised at the United Nations, a number of the U.S.’s closest G7 allies have refused to implement additional sanctions against Syria without proof of Assad’s guilt. Yet the New York Times and other mainstream U.S. outlets continue to report as undisputed fact that Assad’s government intentionally carried out this attack, and furthermore, that Moscow knew about it in advance. These retorts could also be used against the accusations of the Russian government engaging in a convoluted conspiracy to undermine Democratic nominee Hillary Clinton’s electoral chances by hacking John Podesta’s and the DNC’s emails in order to expose the Democratic establishment’s undermining of Bernie Sanders’ insurgent campaign while simultaneously “elevating” Trump’s candidacy in the media through the so-called “pied piper” strategy, with the evil geniuses of the Kremlin somehow knowing beyond a doubt that this information would sway voters in favor of voting for the least popular major-party nominee in a generation. Just as the NYT has denounced theories surrounding the Syria chemical attack as lacking evidence, so too could the entire Russiagate narrative be picked apart as lacking any foundation in fact. All that one needs to do is actually read the U.S. intelligence assessment that dubiously concluded that Russia “interfered” in the election without offering anything approaching hard proof of this claim – spending seven full pages instead bashing the Russian network RT for its perceived biases. The closest thing to evidence that could be found in the DNI report was regarding so-called Russian fingerprints on the hacking attacks of Podesta’s and the DNC’s emails, including malware associated with Russian hackers, as well as some Cyrillic letters and the phrase “Felix Edmundovich,” a reference to the founder of the Soviet Union’s secret police. However, as revealed in subsequent WikiLeaks’ disclosures of the so-called Vault 7 documents, the CIA has developed numerous tools, including a library of foreign malware, that can be used to falsely implicate a foreign intelligence service in a cyber-attack. These revelations called into question the entire basis for Washington’s case against Moscow for allegedly interfering in the U.S. election, but besides a few articles in the alternative press, including at Consortium News, the revelations received scant attention. Apparently, the disclosures of CIA hacking activities – including new revelations of the CIA deploying malware in Samsung televisions as covert listening devices to spy on unwitting Americans – were not the sort of conspiracy theory considered worthy of sustained media coverage in the United States. In contrast to the months of wall-to-wall coverage of Russiagate, the Vault 7 leaks were largely treated as a one-day story by the mainstream press. The disparity in coverage speaks to a longstanding aversion of the mainstream media to what it considers illegitimate “new media” encroaching on its territory and peddling conspiracy theories and what is today called “fake news.” This hostility can be traced to the earliest days of the internet. Newsweek also criticized Oliver Stone, director of “Platoon” and “JFK,” and Chris Carter, the creator of the popular “X-Files” television series, for promoting dangerous ideas that had the effect of eroding trust in the government. “On ‘The X-Files,’ everything from who killed JFK to why the Buffalo Bills lose so many Super Bowls is traceable to a single master plan,” Newsweek sneered. Of course, Newsweek wasn’t alone in scoffing at popular conspiracy theories in the ‘90s. In fact, it was conventional wisdom among “respectable” media that government leaders simply do not cross certain lines, and that certain stories, for example, regarding CIA involvement in the cocaine trade – no matter how much evidence backed them up – were off-limits. Those who failed to get on board with this groupthink, for example Gary Webb who wrote a widely disseminated series for the San Jose Mercury News about the CIA-crack cocaine connection, had their careers destroyed. This trend continued into the 2000s, with millions of angry Americans still seething over the stolen election in 2000 told to “get over it,” and then called crazy for doubting the basis for George W. Bush’s case for invading Iraq in 2003. A couple years later, those who raised questions about the government’s botched response to Hurricane Katrina were accused by the Washington Post of “racial paranoia” and hawking “conspiracy theories,” such as the widespread belief that New Orleans’ levees may have been intentionally blown up to protect rich neighborhoods at the expense of poorer ones, or to drive low-income African Americans out of town. But skip ahead a decade, and oddly, this same media that historically has been so hostile to conspiracy theories was seen eagerly pushing conspiracy theories surrounding Clinton’s loss to Trump. Headlines of “Russian election hacking” were freely used by the Washington Post, CNN and the New York Times, despite the fact that there is zero evidence that Russia manipulated any voting machines in any state to alter the outcome of the election, or even any substantial proof offered to support the claims that the Kremlin attempted to influence voters’ decisions by exposing private emails between DNC officials. Nevertheless, the Democrats and the media have coalesced around the conventional wisdom that the election was lost due to a Russian plot, which conveniently absolves the national Democratic Party of any responsibility for losing the election – for example by writing off the white working class vote or nominating a deeply flawed establishment candidate during a decidedly anti-establishment year – while simultaneously calling into question the legitimacy of Trump’s presidency. It also feeds into the rallying cry that the Democrats have embraced since losing the election, which has been variations of the theme “This is not normal,” expressed by the hashtag #NotNormal on social media. This theme laments the loss of a more “normal” time, presumably personified by Trump’s predecessor, Barack Obama. Typically, the slogan refers to Trump’s controversial dealings with Russia, his unconventional communication style and his extensively documented conflicts of interests, as well as perceived misogyny, nepotism, racism and incompetence in his administration. Clearly, there is very little that can be considered “normal” about this administration, including the strange role of Trump’s daughter, Ivanka, who has moved into the White House while the First Lady, Melania Trump, lives in New York. The First Daughter reportedly was instrumental in convincing the President to carry out the unilateral attack on Syria. “Ivanka is a mother of three kids and she has influence. I’m sure she said: ‘Listen, this is horrible stuff,’” Ivanka’s brother Eric Trump told the Telegraph. In today’s America, what is normal, according to the bipartisan consensus, are unilateral strikes against countries without evidence and in violation of international law. It is also apparently normal for televisions to spy on law-abiding citizens, and with drone strikes shooting up 432% under the Trump presidency so far, it is apparently quite normal to use flying robots to bomb suspected terrorists (and their eight-year old daughters) half-way around the world. Indefinite detention at the legal black hole of Guantanamo is also rather normal. After all, these are all policies that have been in place for a decade and a half under both Democratic and Republican administrations, and hope seems to be dwindling for returning to a period of actual normalcy. The US has no convincing evidence that the Syrian government was behind the alleged chemical weapons attack in Idlib, the Russian Ministry of Defense said, denying a CNN report claiming the US had intercepted Syrian military communications proving this. “If the US intelligence services choose to keep their alleged evidence of crimes against humanity secret, there can only be one possible explanation – they simply have no irrefutable evidence,” the spokesman for the Russian Defense Ministry, Major General Igor Konashenkov, said on Friday, according to TASS. The Russian Ministry of Defense said the CNN report was based on “pseudo-evidence” that the US media often uses to support Washington’s objectives. “In line with a long-standing tradition, the Pentagon always mentions some ‘irrefutable’ evidence of atrocities in an attempt to justify every US violation of international law and, particularly, US military aggression against sovereign states. And the more contrived this pseudo-evidence is, the more secretive it is,” the spokesman added. Last Friday, the US launched 59 Tomahawk cruise missiles from the Mediterranean Sea targeting the Syrian military’s Shayrat Airbase. The strike was ordered by US President Donald Trump in response to the alleged chemical weapons attack in Khan Shaykhun on April 4. Russia has demanded that the US produce the evidence with which it allegedly established that chemical weapons were, indeed, flown out of an airfield in Homs province and used by the Syrian military. Though the Pentagon has yet to offer any tangible proof, on Wednesday, CNN ran a report based on an ‘anonymous source’ claiming that the US military had intercepted communications between the Syrian military and chemical experts in which preparations for last week’s alleged chemical weapons attack were discussed. Recently, there have been a growing number of suggestions by Chinese diplomatic and military commentators that Beijing is not obliged to defend Pyongyang in the event of a military attack, an article in the South China Morning Post read. The assumption comes as senior officials in the United States have warned of a strike against North Korea. In particular, Washington has positioned two destroyers in the region that can deploy Tomahawk missiles, according to what intelligence officials told NBC News, along with heavy bombers stationed in Guam that could provide support should such a strike take place. “North Korea is a problem, the problem will be taken care of,” US President Donald Trump told reporters Thursday. Chinese media outlets and even some official websites have recently published articles saying that in the current situation there are fewer options to find the peaceful solution to the North Korean nuclear issue. For example, on March 22, website China Military, sponsored by China’s People’s Liberation Army (PLA), published an article commenting on a ground test by Pyongyang of a new type of high-thrust rocket engine. “We believe that warfare is just a matter of time if DPRK continues its nuclear and missile program. […] Under no condition will the international community accept DPRK’s legal possession of nuclear weapons and intercontinental ballistic missiles. As Pyongyang continues with its nuclear programs, international sanctions will get tighter, and it will eventually be isolated from the rest of the world for a long time,” the article read. It is not in Pyongyang’s interests to go against international community’s stance on nuclear weapons. In a situation when the US, Russia and China share views of North Korea’s nuclear ambitions Pyongyang has almost no room for maneuvering. On the other hand, Pyongyang’s decision to give up its nuclear ambitions would satisfy the interests of the North Korean political elite, without posing a threat to the country’s existence. This assumption was made before President Trump and Chinese leader Xi Jinping met in Florida, which proves that Beijing toughened rhetoric towards Pyongyang not under the influence by Washington. In formal terms, China is North Korea’s only military ally, according to the 1961 Mutual Aid and Cooperation Friendship Treaty. At the same time, many Chinese experts say that de-facto those obligations do not exist anymore. The reason is that Pyongyang’s nuclear ambitions have formed an epicenter of tensions near China’s border. “Despite China’s support for North Korea during the 1950-1953 Korean War, in the current environment, Beijing will prioritize national security over ideology,” Andrei Karneyev, deputy director of the Institute of Asian and African Countries at Moscow State University, told Sputnik China. According to the expert, this change of heart is not related to any pressure from Washington, but is dictated by security needs. However, the question remains: what would China do in the event of a military confrontation against North Korea? 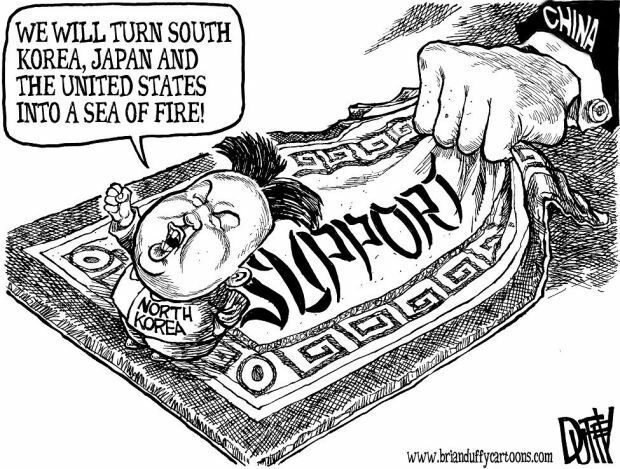 Shanghai-based military analyst Ni Lexiong told the South China Morning Post that Beijing would need to provide military assistance to its neighbor if US troops invaded, but Pyongyang’s violation of the UN non-proliferation treaty was a “strong reason” for China not to help. According to Zhan Debin, an expert from the Shanghai University of Foreign Trade, there is little chance of a military conflict on the Korean Peninsula. “The US is unlikely to attack North Korea on its own initiative. It would be possible if Pyongyang endangered the key security interests of Washington and Seoul. This would be an adequate reason for the US,” he told Sputnik China. The expert pointed out that the US military force redeployed to the Korean Peninsula is rather a warning for Pyongyang. He added that the probability of minor conflicts between the US and North Korea is very low because any minor conflict will turn into a large-scale confrontation. “We can’t say that the US recklessly wants to start a war. Of course, South Korea doesn’t want war. If a conflict broke out South Korea would be hit the most,” Zhan Debin said. Commenting on China’s actions during the hypothetical confrontation, the expert noted that Beijing may not get involved if Pyongyang provoked a conflict, but at the same time China cannot turn a blind eye to instability in the region. “Of course, Beijing will try to prevent a conflict from turning into war. China will not supply weapons and provide military and combat assistance,” he said.